Shyeeta set her mind on finding a job. Her recent birthday cruise with her brother had whet her appetite for independence, and she was determined to make her dream of living independently one day a reality. To do that, she knew she had to start by earning her own money. The road to success had a few bumps along the way, but Shyeeta’s positive outlook helped her through. Since high school, Shyeeta had the desire to work, but few employers were willing to give her a chance. She found that many places were inaccessible for her wheelchair, and her lack of experience did not make it easier. Frustrated, she turned to Coastal Center for Developmental Services (CCDS), a place where friends from her school had successfully gotten training to start their careers. During the day, she participated in the training program where she fine-tuned her dexterity, speed, and stamina. In the afternoon, she joined the CCDS Job Seekers group to learn the soft skills that would make her attractive to prospective employers and give her the confidence she needed to land the right job for her skills. Armed with the right tools and a positive attitude, Shyeeta became a force to be reckoned with. 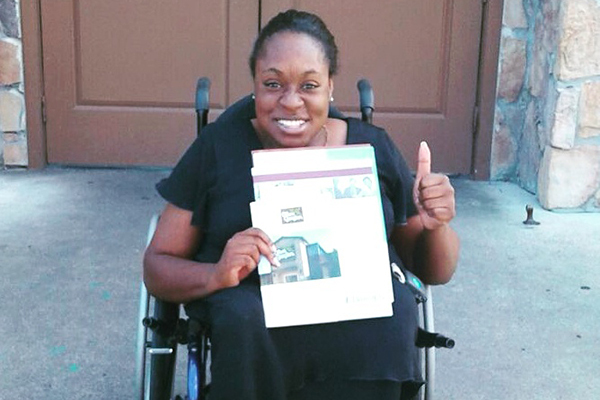 In August, Shyeeta had a meeting with an employer for a restaurant job. Excited, she waited nearly an hour with her job coach, Sophia Navarro-Sharpe, for the manager to meet with her. Sadly, she got stood up. Undefeated and still full of confidence, she accepted another opportunity her job coach presented to her – Olive Garden. It had been a favorite of her grandmother’s and she was familiar with their menu and setup. That day, Shyeeta landed the enviable job of host at Olive Garden. Shyeeta is grateful for the program that helped to prepare her for employment and that is working to change attitudes about people who have developmental disabilities. The Community Employment program at CCDS operates with the belief that having the opportunity to work changes lives, not only for the person with a diagnosis but also for the co-workers that work alongside of them. It breaks down barriers and stereotypes, proving that we are more alike than different. Working primarily on weekday afternoons, Shyeeta gets to experience the lunch crowd as one of the hosts. “I like to make them feel welcome,” she smiled, busily scanning the computer for an available table for newly arrived customers. CCDS currently supports 226 individuals employed in Chatham, Effingham, and Bryan counties, providing training, placement assistance, and job coaching. 86% of those individuals are employed earning above minimum wage. Thanks to generous donors in our community, the CCDS training program and job coaching supports are available to Sheeyta, and other ambitious adults with developmental disabilities, ensuring that everyone is able to harness their abilities and live a full and meaningful life. Your support is crucial to giving folks the opportunity to be their best.